If you haven’t caught up by now, the Standard American Diet – appropriately nicknamed SAD – is horrible. It’s literally killing people every day. 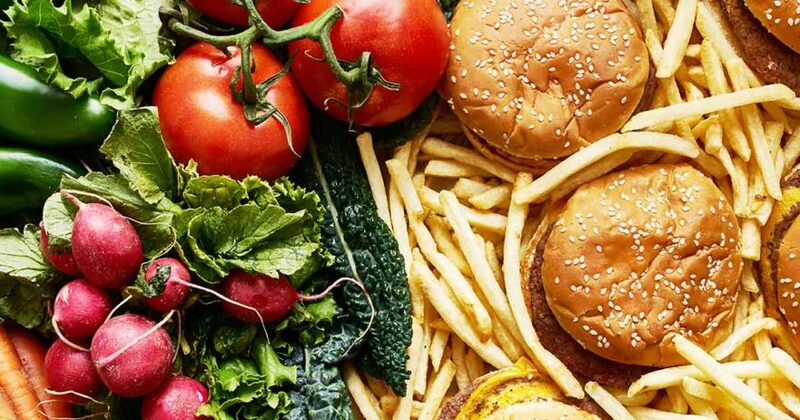 Driven by profit-hungry food industries, misinformed social media personalities, and a number of fad diets, it’s almost impossible to read between the lines without doing your own research. We’ve done some of the legwork for you and identified 30 healthy foods that you can substitute for the more common, unhealthy options we’re all so familiar with. 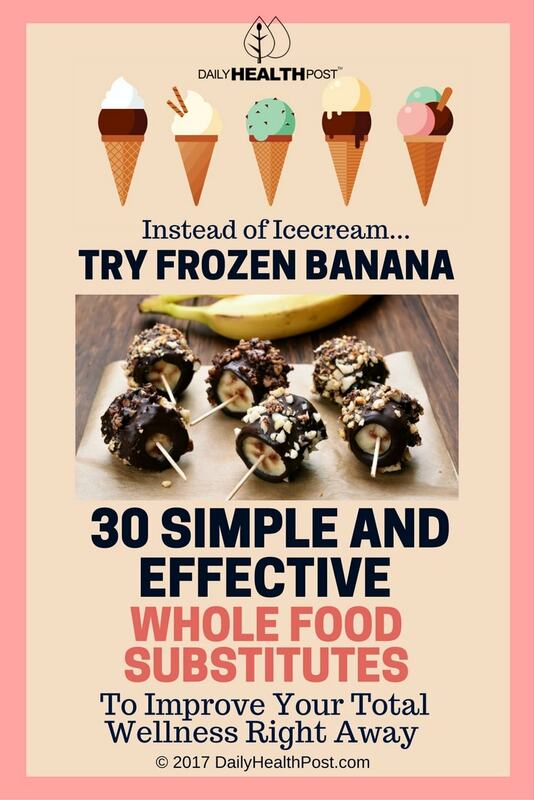 Stick with these swaps and you’ll see (and feel) your health improve almost immediately! Gatorade: the refreshing electrolyte drink to help replenish lost water and nutrients during and after physical activities. What the advertisements leave out is how much sugar is used to give it a sweet and satisfying flavor. If you’re a professional basketball player who exercises for several hours a day this might be ok, but it’s more sugar that any average Joe could reasonably make use of in a day. 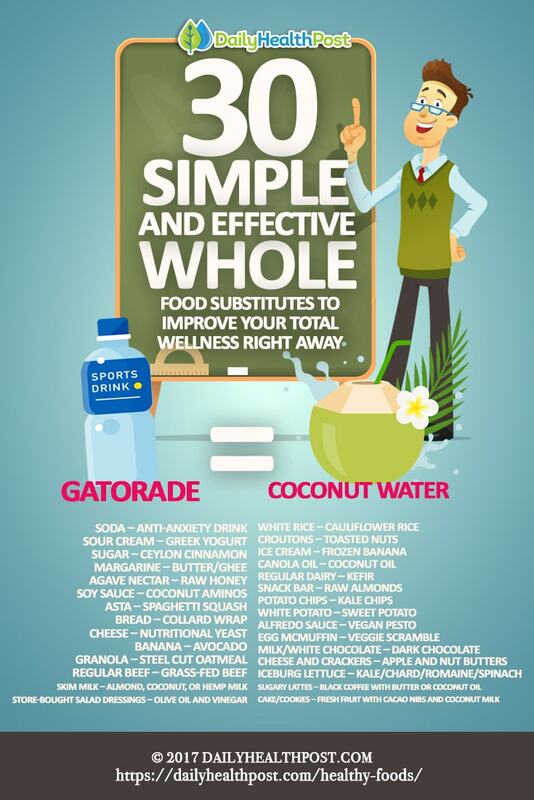 Try nature’s gatorade: coconut water. 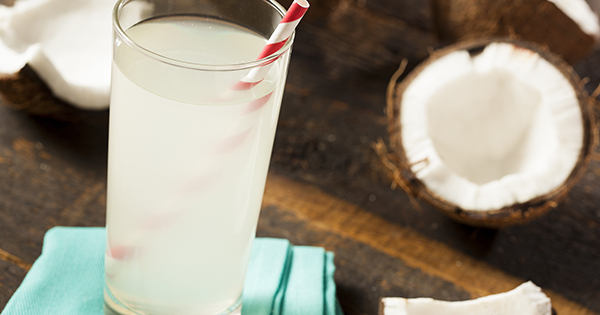 Coconut water is naturally loaded with magnesium, phosphorous, potassium, and sodium – the electrolytes that the body loses during physical activity. If you’re in a pinch and unable to find coconut water, at least go for Pedialyte instead of Gatorade – don’t give extra sugary stuff to your kids! The average froo-froo latte is surprisingly bad for you (yes, this includes the popular Pumpkin Spice Latte available every fall). They are full of inflammatory sugars, packing little more than empty calories. You really can – and should – do much better. 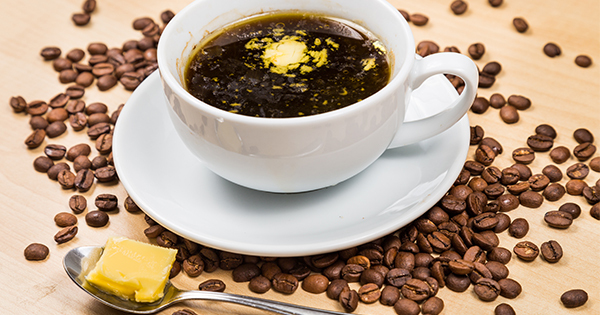 As coffee is one of the most modified crops in the world, opt for a GMO-free organic brand. Blend it with organic butter and/or coconut oil instead of heavy cream and sugary syrups. This concoction is surprisingly creamy, and the healthy fats will satisfy you for hours. For extra flavor, add cinnamon and/or honey and reap some additional health benefits too (which are detailed later in this article). Most breads are almost pure carbohydrates (many brands actually add quite a bit of sugar as well), and anything made with grain contains gluten. Because bread actually goes bad rather quickly, many store-bought brands contain some kind of preservative to extend the shelf life. Overall it’s just not a good food to be eating daily (or at all if you have gluten sensitivity/intolerance). 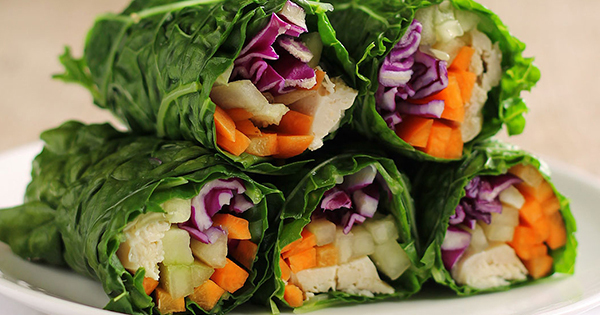 Collards greens are a great option to make a wrap in lieu of a sandwich. They are rich in fiber and especially high in vitamins and minerals – to include vitamins A, C, K, B, calcium and manganese. 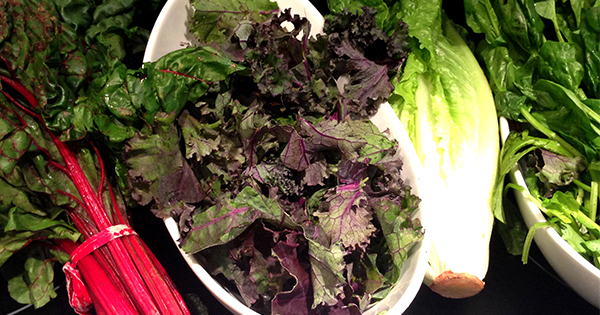 There are several kinds of collard green suitable to use as a veggie wrap, so you can choose one based on flavor, size, and ability to hold up with its fillings. Collards are naturally low in sugar and fat, and are said to be able to help lower bad cholesterol when consumed regularly. Iceburg lettuce is an inexpensive option for salads and as a condiment, but it has little nutritional value when compared to other types of greens. The rule of thumb for almost all vegetables (and fruits) is that the brighter or more vibrant the color, the more beneficial it is in terms of vitamins, minerals, antioxidants, and phytonutrients. Spinach, chard, romaine lettuce, kale, arugula, and cabbage are all extremely nutrient-dense and more flavorful options to consider. Dairy may not be an issue for you, but most people have some level of lactose intolerance that makes digesting dairy products (like cheese) painful and difficult. Cheese on its own is not necessarily bad for you, but it tends to be high in fat as well as processed ingredients. Whenever possible, opt to use nutritional yeast on dishes you would usually sprinkle cheese on. 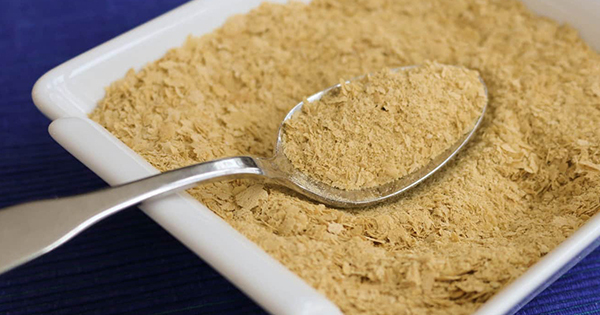 Nutritional yeast has a cheesy flavor to it and is naturally low in fat. Yeast can also aid your digestion, which is the opposite effect cheeses tend to have. Since it is a form of protein (to the tune of 3g per tablespoon), nutritional yeast contains a full range of amino acids, which are needed to build and repair muscle fibers.